We are an adult clan (16 years and older) based in the USA. We war three times a week. We are here to learn from one another and have fun. Winning loot and crushing our opponents is a nice perk, too. Our win ratio is 78%. Our big brother clan is Purdue Alumni. Purdue Alumni is a large clan of well developed bases you may not fit there, but worth a look. Both clans operate under similar rules / expectations. Indeed some of us have accounts in BOTH clans. War times are approximate and vary 5 minutes to 55 minutes due to match making time. Communicate: In English, and kindly. Latin alphabet village (player) names only so we can address one another. English only in text and troop requests. Kindness please. No slamming swearing, vulgarity or abusing others. Donate: Troops often and appropriately. Please specify WHAT you want, and donate only what is asked for (if you have it). If you are not in the war, please be on hand to donate troops. Make some Dragons, wizards or giants for your clan-mates. Participate: In Wars and in helping one another to become better players. Attack the assigned target first and within 8 hours – preferably in 4 hours (or negotiate for a different target). Help others with advice when they ask. Engage in challenges to practice your war attacks and help others practice theirs. Yes, if you meet our humble requirements. You must be at LEAST TH7, have dragons and a Barbarian King. You must be at MOST TH10. This is to help us be favorably paired with opposing clans. Don’t worry, you’ll still be included in war once you reach higher levels. Your research (offense) should be ahead of your defense. Affiliation with Purdue University, West Lafayette, Indiana is desired, but not required. Adult (ages 16 plus) – or the child of an existing member.We sometimes make exceptions to the rules above. Did you request to join, and get kicked out? It’s because we want you to read these instructions. No slight is meant. Please keep reading… including the War Expectations section! The survey is here: (CLICK HERE). Complete the survey before asking to join True Purdue! Attack your assigned target first. Assignments are made by clan mail and in Clash.Tools and may be adjusted in chat. Your assignment will usually be +0 (peer) to +5 (that is, your enemy peer who is one to 5 War ranks weaker than you). Make your first attack as near the start of the war as practical for you, but make it in less than 8 hours! Remember we are a TEAM. Players eligible for war who do not attack, or only make one attack hurt the clan and may be demoted or removed from the clan. War loot is awarded 100% to the winning team and only 30% to the losing team… obviously winning is better! Remember that you can OPT IN or OPT Out of War on the “My Profile” page. If there are more people willing to battle than spots available, the search will exclude those who: Request to be excluded in chat, did not make timely attacks in the last war(s) [later than 8 hours*, or less than two attacks], appear to be inactive (low donations, no league after several days, no presence in chat), haven’t completed the clan survey, or very recently joined the clan. *NOTE: We sometimes intentionally hold back high attackers, these are not counted as late. This is a War clan. Do not expect to opt out of every war. Players with maximum troops (after +2 clan perks) are expected to help populate war castles of the others. Allow your clan-mates 8 hours to take on their first assignment before attacking an assigned base. If practical also wait before making a second attack … but DO make a second attack. Second attacks should be made to: clean up (get 3-stars) for failed attacks, scout a base for another player, or to grab war loot. Please chat if you are not sure which option to take. Once the 8 hour period has expired (says status “expired” in Clash.tools) unattacked bases are considered “clean ups”. Bases claimed and not attacked in 4 hours are up for grabs. Your goal in attacking is always to gain 3 stars! However sometimes we ask that you attack in a particular way so that you can learn additional attacking styles. Dragons are great… but only can take you so far. Top players in war have some leniency in attacking later than 8 hours… but should not be necessary if the lower 3/4 attack in a timely manner. Do NOT go into battle without a full clan castle and healthy heroes. Study your enemy and decide on a strategy before attacking or even asking for troops. NOTE: Archer rushes, Giant rushes or Barbarian rushes will fail in War UNLESS your opponent is exceedingly weak. In many attacks you must scout out a place where you can draw out the clan castle troops and kill them. 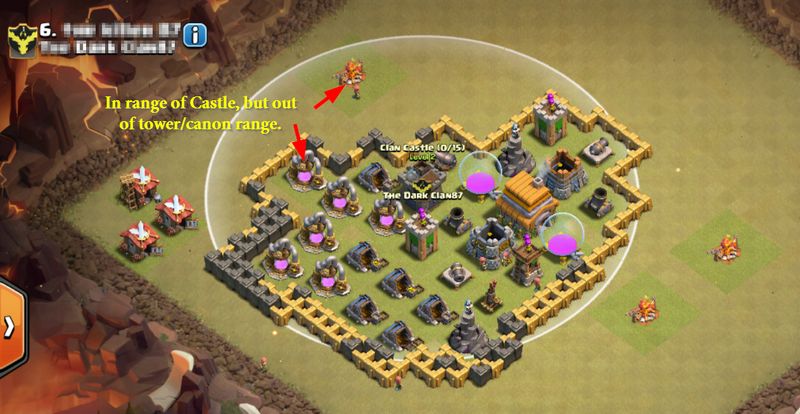 Best is away from defenses and NOT near buildings that your troops will target instead of the castle troops. You may need to sacrifice a few troops to get the castle out. HINT: The castle troops only react when your attacking troops fall within the radius of the Clan Castle. GIANTS and BALLOONS will NOT target castle troops until there are no defenses left. Poison can be used to kill CC troops, but you must keep the enemy occupied with your own troops. Range of view of the Castle. Note the Unprotected wall near the indicated elixir collector. A couple of goblins could easily dig through it. Click for a larger image and notice that there are 0 of 15 troops in the castle! When attacking never drop all your troops in the same place. One mortar shot or wizard blast may kill them all! That is, do tap, tap, tap, not tap and hold. Or try tap-hold-and-smear to drop troops to make, e.g. a nice semi circle around a tower or a whole village. Castle archers will fixate on a target, while they head to it, drop barbarians or valks right on the archers with a wizard/archers outside. Against barbarians or giants use a circle of archers with a few barbarians inside. Against wizards, a ring of archers is best. Attack similar to archers. For Valkryies DO NOT surround tightly. Valkryies kill everything around them. Counter valks with valks and wizards or flying troops like baby dragons. When facing flying units: archers and wizards spread out/around will help – or sic your own dragon on them. Drop a slow moving troop right “on” a dragon to distract it. BEFORE preparation day ends, be sure to start building any defensive structures/wall upgrades. Even if not finished, a started Wizard tower, for example will be active during the war! And do not worry about defense upgrades. Unlike regular play, in war your defenses are always active. For more strength in your attacks, upgrade your camps. In WAR the goal is STARS, not loot. There won’t be a lot of loot – and what is there is ONLY in storages plus the bonus. Best bet is to be SURE you can destroy the enemy Town Hall, often you’ll also get 50% for that second star as well. It’s a good idea to practice your war attack by making friendly challenges vs our other clan members. You can determine how many troops are in the enemy clan castle with the “info” button. It won’t tell you what troops, but you may discover the castle is empty or has only a few troops. Likewise you can how XBOWs and Inferno Towers have been configured with the info button. Beware of playing the game where you have a weak or intermittent signal… you could lose due to a dropped connection! When deploying troops, tap as close to the structure as you can. Dropping troops at the edge of the screen gives towers plenty of time to kill them before they get close to the target. 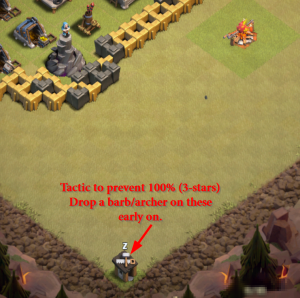 Give towers something to target (giants, barbarians, golems) to distract them when deploying fragile things like wizards or balloons. Poison before heal. Drop your poison spell on the enemy before using a heal spell. Poison reduces the attack. If you try to drop heal first your troops could die before the heal gets going. We use quite a few abbreviations in our communication and here are a few tips. “dump” – literally means any troop is fine. Usually used prior to or during war so others can get rid of troops they don’t need and get the bonus. “defense” – any troops good for defense… E.g. Dragons, valkrys, wizards, witch. Not giants, goblins, healers. “any” – like dump, but something useful, hopefully. It’s also helpful to say “for war” so others can prioritize war troop donations over regular donations. We often express WHERE on a map using clock position. So 6′ or 6 means the bottom of the map. 3 or 3′ means the right side, 12 the top and so on. Once in a while we say “east” or “south” or “north” – these assume that north is UP on the map. Means: Bell Bell: Zap-quake the air defense toward the lower left. Drop 5 wall breakers at the SSE corner of the map near the builder hut. Member: A person in the clan who will normally be excluded from war, and may be kicked from the clan – usually due to failure to participate. See rules above. Members cannot invite or accept members into the clan. Elder: An earned (or lost) position – allows you to invite and accept people into the clan. Only invite or accept those who meet the requirements listed above. PLEASE DO NOT eject anyone. Let the Leaders or Co-Leaders do any ejecting. Co-Leader: Can promote/demote or eject anyone (Elder or lower), start a war search, and send Clan Mail. This position is earned through trust. We automatically distrust anyone who ASKS for this role as persons with Co-Leader power can wreck the clan. Leader: The creator of the clan – and or the leader’s designee(s). Only the leader can demote or eject co-leaders. Leader has all of the privileges of Co-leader. Assignments are on Clash.Tools See Clash.Tools for War History, too. Wanna See Some Awesome Battles?